This is the all-new BMW M3 Saloon. It’s a four-door version of the M4 Coupe, and underneath the two cars are mechanically identical. Famed for being one of the best drivers’ cars around thanks to fettling by BMW’s M Power department, the M3 has historically been an incredibly popular model. In fact, the previous generation sold over 40,000 models, which for a machine like this is very impressive indeed. Moving away from the previous car’s V8, the new M3 Saloon gets a 3.0-litre twin-turbocharged six-cylinder petrol engine which develops 425bhp and peak torque of 550Nm between 1,850 and 5,500rpm. It’s mated to a six-speed manual gearbox as standard, with the option of a seven-speed automatic gearbox. While the former features throttle-blipping to match the revs when you’re down-shifting, the latter has a launch control function for perfect getaways and - believe it or not – what BMW call a ‘Smokey Burnout’ function which allows unsolicited showing off at low speeds by spinning the rear wheels up. With the manual ’box you can expect to cover 0-62mph in 4.3 seconds, and this drops to 4.1 seconds with the automatic. Top speed for both cars is limited to 155mph, but an optional M Driver’s Package sees this rise to 174mph. BMW has really gone to town on the chassis of the M3, developing the adaptive suspension, 19-inch wheels and tyres to work in perfect harmony. Coupled with the car’s rear-wheel drive configuration, we’re expecting it to be a seriously rewarding car to drive quickly through corners. On the back axle there’s an electronic differential which actively helps steer the car into a bend, further enhancing the car’s agility. The steering set-up is electric, but offers three ‘modes’ – Comfort, Sport and Sport+ - which offer different levels of steering assistance depending on the type of driving you’re doing. A number of weight-saving measures have been taken over the regular M3 too, including the application of lightweight carbon fibre reinforced plastic, which should serve to improve handling and also boost efficiency. Thanks to lighter construction and a more efficient engine, the new M3 will return a claimed 34mpg average fuel economy (32.1mpg for the manual) and emit 194g/km of CO2, meaning road tax band J. Inside the car you can expect a premium yet sporty feel, with race-inspired bucket seats taking centre stage and a sports steering wheel along with liberal application of M badging. You’ll get a free lap timer application to download to your smartphone which, when hooked up to your car, will analyse your driving style and show you where you can go faster. There’s a whole host of optional extras available to further personalise your M3, including a head-up display which projects rev counter, shift point and gear display information onto the windscreen. 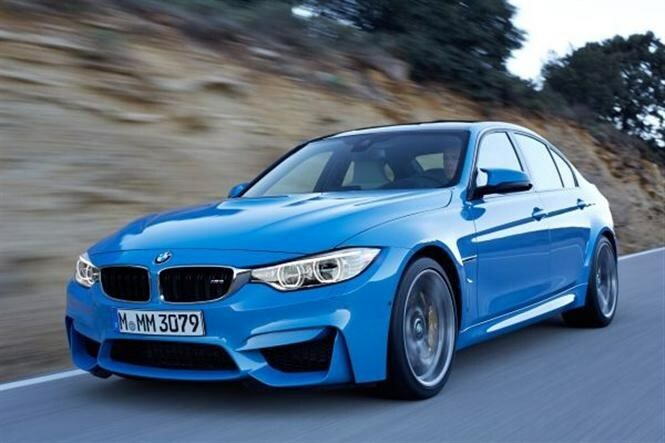 We’re expecting the new M3 will cost just over £56,000 when it launches in spring 2014.